What is this silver/silver plate(?) dish used for and what is it worth? This dish/container was my grandmother's, and I've yet to find someone who could tell me what it's use was. Does anybody know? What do the markings on the bottom mean? The round dish portion is 3 inches or so across. The side vertical part is 3 inches from top to bottom. 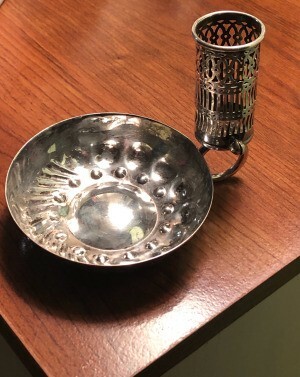 I think it is an ashtray with a holder for matches. 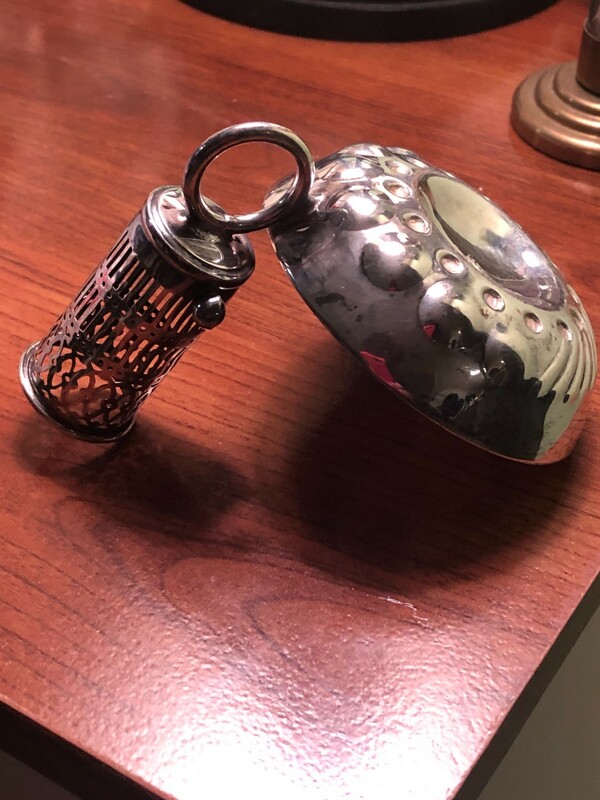 I think it is silver because of the marking on the bottom. 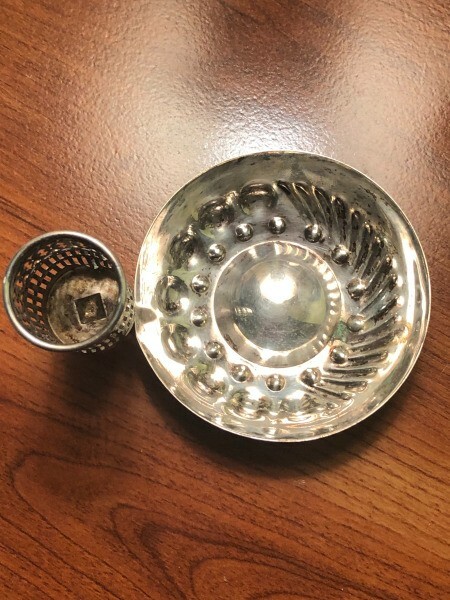 I believe this is an ashtray/match or cigarette holder. 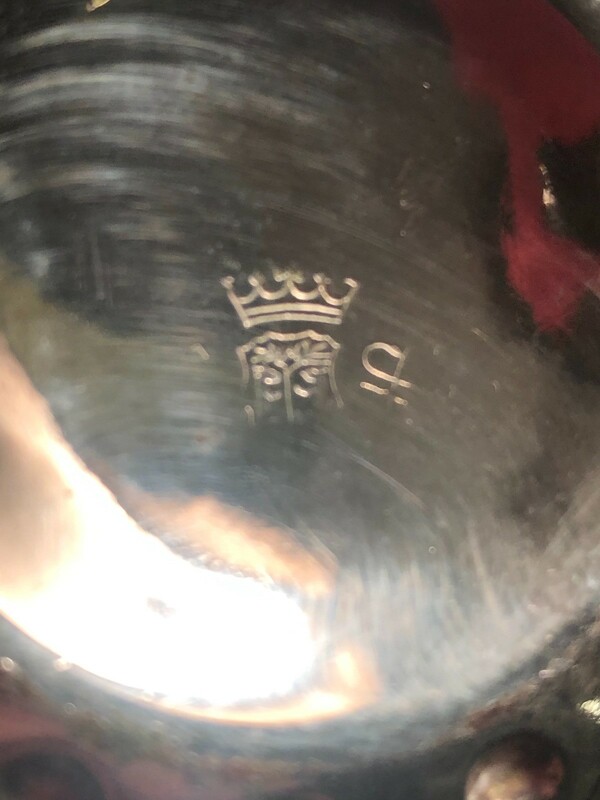 I am not familiar with that marking to tell if it is real silver or not. There are too many markings to know them all. My advice is to take it to a reputable silver sales place (like we have Treasure Hunt) and ask them to ID it and give you a scrap value. Once they ID it, you can check eBay sold and find the name to get a sale value (vs. scrap). I haven't checked silver prices this week (they have been low). Most of the similar items on eBay (I did not see an exact match which would be the only way to give you your exact item value) but similar items are selling for around $30. That said, there were also a bunch that sat unsold, so people really need to know the maker to help them decide if they want to add it to their collection. Post back what your local expert tells you about the name. Thanks to all for the info and advice! I cant imagine flicking ashes onto sterling silver! The circle handle for carrying makes sense for portability for a smoker. Another antiques dealer thought it might hold a tube of lipstick in the cylinder and bobby pins in the tray. I appreciate these replies.